Get the License Plate that Supports Housing Affordability! Every NC REALTORS® Housing Foundation license plate increases housing opportunities throughout North Carolina. $20 of the special fee comes back to NC REALTORS® Housing Foundation as a charitable contribution. We turn these contributions into grants to organizations that help hardworking families with their housing needs. Supports affordable housing with an automatic, annual $20 contribution. Supports the business you’re in. The personal message builds your image. You can purchase a NC REALTORS® Housing Foundation license plate at any NC Dept. of Motor Vehicles license plate office or on its website. How do I purchase a plate online? To find information on the DMV website, search for the “NC REALTORS® Housing Foundation” plate in the alphabetical list. 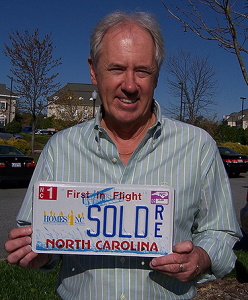 Once you pull-up the NC REALTORS® Housing Foundation license plate, you can purchase and personalize the plate online. To purchase a plate, you’ll need to have your current vehicle registration info handy. For a quicker checkout, go directly to this DMV page.